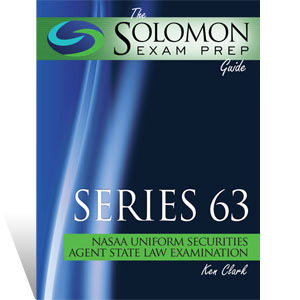 If you want to study for your NASAA Series 63 exam as efficiently as possible, "The Solomon Exam Prep Guide to the Series 63" is for you! At less than 200 pages, the study guide cuts to the chase, providing contextual background and real-world tips to help you memorize and apply the rules on the exam. Written by Ken Clark (who scored a 100% on his Series 63 exam! ), "The Solomon Exam Prep Guide to the Series 63", now in its 4th edition, comes with two (2) complete practice exams, short quizzes after each chapter and a helpful glossary. The exam study guide is available as an online digital manual via your online student dashboard (requires Internet connection/not downloadable) or as a hard copy textbook (shipping & handling will apply). Please note: the digital guide and hard copy guide contain the same content, however, this image is a PDF of the hard copy guide and the digital guide is not a PDF and it does not look exactly the same as this PDF of the hard copy. If you want this exact look, you must purchase the hard copy upgrade. To view a sample click here. We recommend studying 30-40 hours over a ten-day period. How do I schedule my Series 63 Exam? A firm will file an electronic Form U4 for a candidate, or an individual will file a Form U10 and pay the registration fee to FINRA. Upon registering, a candidate will have 120 days to schedule the exam. You can find more details here. What does a Series 63 license allow me to do? A Series 63 license qualifies you as a securities agent. It covers the principles of state securities regulation. A score of 72% is required for passing. Note: Your score will be rounded down to the lowest whole number, so a 71.9% would be a final score of 71%-- not a passing score for the Series 63 exam. What happens if I pass the Series 63 but I do not complete the registration process? After passing the Series 63, you have two years to become registered with a state otherwise the exam will show “expired” in the Central Registration Depository, and you will have to sit for the exam again. Contact your state regulator for more information regarding your state’s registration rules and process. There are 60 scored and 5 unscored. These five unscored questions are randomly distributed so test-takers do not know which ones they are.The unscored questions are being tried out by the exam committee. 75 minutes. You are allowed to take restroom breaks during the exam; however, the clock will continue counting down. Please contact your preferred testing center for additional information. Are there other FINRA exams I need to complete as a prerequisite to attempting the Series 63? The cost of the exam is $125 at this writing. If I stop working for my firm, how long will my Series 63 license remain active? When you cease working for a firm, your employer will file a Form U5 to terminate your registration. Your next employer will file a Form U4, which will re-register you. As long as you do not exceed two years between employers, your Series 63 license will remain active. I'm not the best test taker. Solomon changed that. I was struggling on the quizzes and practice test. However, I passed the SIE on the first try. Took me less than one hour to complete. I felt very prepared. I passed the Series 26 today with a score of 82%. Your exam simulator helped tremendously.